Civil Litigation, including Labor and Employment Law (litigation, investigation and training), Professional Errors and Omissions (malpractice), Personal Injury; and Defense Orientated Consultation to Employers, Businesses and Insurers. John Aberasturi was born in San Francisco, California, on March 23, 1956. He attended the University of Nevada, Reno (B.A., 1978) and the University of the Pacific, McGeorge School of Law (J.D., 1981). Mr. Aberasturi was admitted to State Bar of Nevada in 1981 and the State Bar of California in 1982. 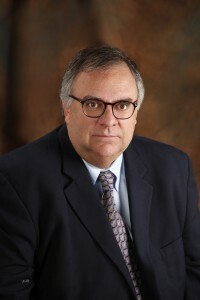 He was a Deputy District Attorney with the Washoe County District Attorney’s Office from 1981 to 1987 and served as Chief Deputy District Attorney from 1987 to 1989. He has been in private practice with Erickson, Thorpe & Swainston, Ltd., since 1989. Mr. Aberasturi is a member of the Washoe County Bar Association, the State Bar of Nevada, the State Bar of California, the Nevada Association of Defense Counsel (President, 1998), the Association of Defense Counsel of Northern California and Nevada (Member, Board of Directors, 2006 — ), and the Defense Research Institute. Mr. Aberasturi is a Master of the Bruce R. Thompson Chapter, American Inns of Court (Program Chair 2008-2009) and is recognized in Best Lawyers in America and as a Nevada Super Lawyer.